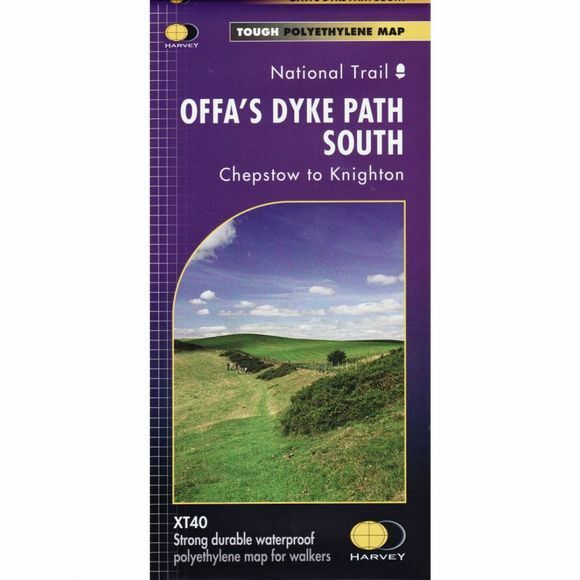 Offa's Dyke Path is a National Trail. It runs along the border between Wales and England, this Southern Section Map covers Chepstow to Knighton. Offa was a famous king of Mercia from 757 to 796, ruling an area stretching across a large part of England. Offa's Dyke Path runs from sea to sea – the Severn Estuary to Liverpool Bay. For about 70 miles the Path follows the course of what was originally an 8-metre ditch and rampart. Castles, forts and historic sites dot the route. Two Harvey maps cover the whole 177 mile route. Each map covers a section suitable for about a week of walking. This map inclues information on finding accommodation, camping, food. Directions to the start. Also Ranger Service contact numbers and enlargements of towns/villages showing facilities available and tips on weather and clothing. Tough, light and 100% wateproof detailed mapping, full legend. National Grid – can be used with GPS. 1:40,000 scale. Supplied in clear plastic pocket.